Place peas, 1 tablespoon lemon juice, 1/2 teaspoon salt and 1.5 litres (6 cups) cold water in a large pan and bring to the boil. Reduce heat to medium-low and simmer for 25-30 minutes until peas are just soft. Drain and rinse in cold water. 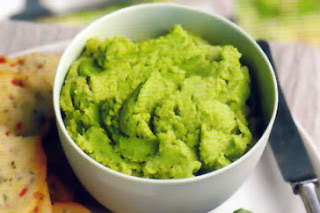 Place peas in a food processor with remaining 2 tablespoons lemon juice and process to a coarse paste. Remove the lid and cool for 10 minutes. Meanwhile, heat the oil in a frypan over medium-low heat. Cook the onion and garlic, stirring, for 5 minutes or until soft. Add ground coriander and cook, stirring, for a further minute. Cool for 5 minutes. Add the onion mixture and coriander leaves to the peas in the food processor, then process to combine. Season to taste with sea salt and freshly ground black pepper. If the mixture is too thick to spread, add 1-2 tablespoons boiling water. Serve with flatbreads and vegetables.